Iris oncocyclus (Iris oncocyclus): growing, planting, caring. A group of bearded irises with large flowers. Full description for Iris oncocyclus not yet available. The best time to plant is between June and October, so your iris will have time to settle itself before winter. 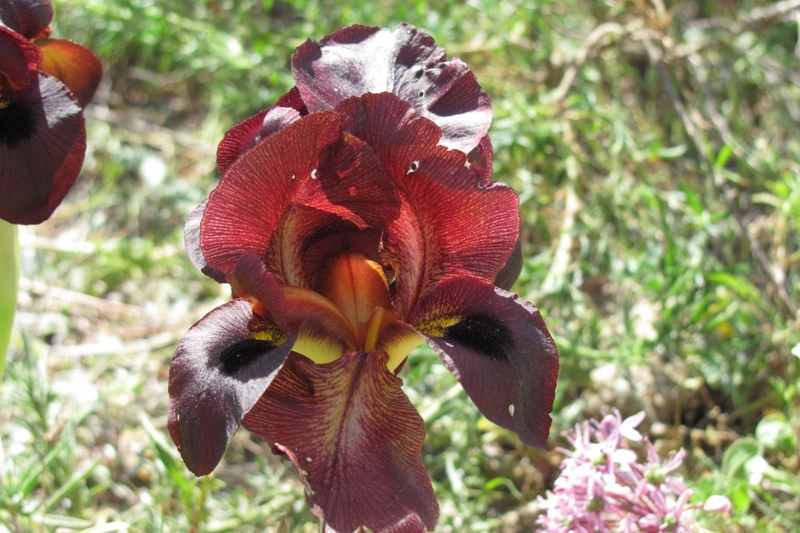 In terms of conditions, we need to look at things separately — we'll make it simple: Bearded irises prefer well-drained, rich soil that's neutral or slightly chalky, in direct sunlight. Prepare the soil with some light digging (to decompact without necessarily turning it over with a pitchfork or broadfork), hoeing, and raking. Add some soil fertilizer if the earth isn't very rich. Plant the rhizome in a small mound of soil away from humidity — it must be practically showing. Pack lightly, water copiously! You can plant irises in small groups of the same variety to make pretty little colored zones.